An employee checks the finish on an Actros long-haul truck as it leaves the production line at the Mercedes-Benz plant in Woerth, Germany, on Wednesday. MUNICH -- Daimler cast doubt on Tesla's plan to deliver electric heavy trucks next year, saying its more modest goal to start selling battery-powered big rigs by 2021 is more realistic. Daimler, best known for its luxury cars, is also the world's biggest truckmaker, giving Daimler the most to lose should Tesla boss Elon Musk succeed in producing a semi-truck with a 805 km (500 mile) range for delivery starting in 2019. 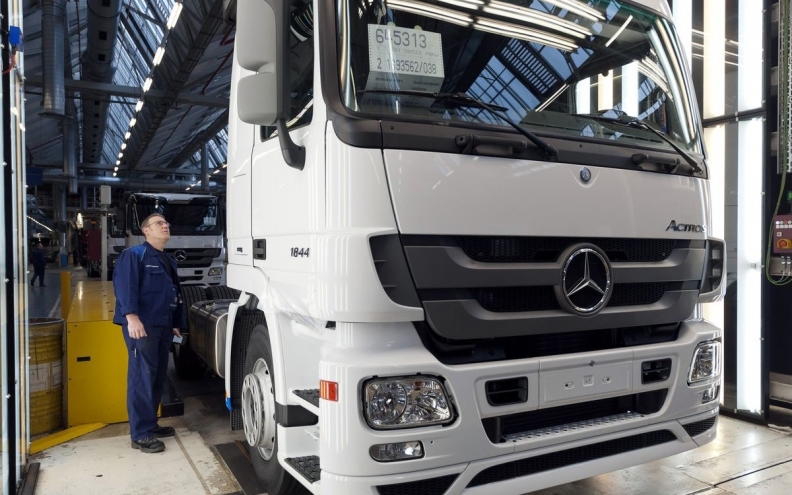 If that happened, Daimler would have miscalculated to an unimaginable degree, head of trucks Martin Daum suggested to reporters at an event Wednesday in Stuttgart. He announced plans to start rolling out Mercedes-Benz electric trucks for trials this year, followed by mass production as of 2021. The driving range is smaller than Musk is targeting. Current battery technology doesn't allow for faster timelines, Daum said. "If Tesla really delivers on this promise, we'll obviously buy two trucks -- one to take apart and one to test because if that happens, something has passed us by," Daum said. "But for now, the same laws of physics apply" in Germany and in California, where Tesla is based, he added. The Mercedes-Benz electric Actros, starting with 10 vehicles, will deliver loads on city distribution routes with a maximum range of 124 miles, Daimler said. German supermarket chain Edeka and parcel delivery service Hermes are among early testers who'll receive vehicles in the next few weeks for a trial lasting around two years. Daimler will spend $616 million this year and next on its effort for electric and connected trucks, it said. Aside from Tesla, other manufacturers like Volvo AB are working on new technology to propel commercial vehicles. High costs and limited longevity of batteries have so far put trucks behind development timelines for cars. The e-Actros as part of the pilot will feature two versions with total weights of 18 tons and 26 tons, Daimler said. They'll take three to 11 hours to charge. Broad demand will need time to take hold, Daimler said. "Trucks have to run for 1.5 million miles and then there's a used-truck buyer too after that," said Daum. "We don't know for sure how batteries for trucks will react after being in use for four to five years -- it's very complex."